Lift off with the helicopter and have the feeling of freedom and expanse! Fly from Ganderkesee and enjoy the view over Lower Saxony and Bremen. The route is discussed directly with the pilot. This depends on the wishes of the passengers, the weather and, of course, the flight safety. Local sights are getting over flown. The air tickets are countable on all offers. Persons over 95kg on request. 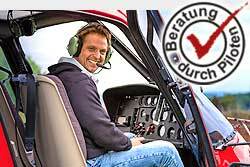 When do you make a helicopter flight from Ganderkesee?